Røros Mining Town and the Circumference comprises a historic mining town and industrial landscape shaped by copper mining. Within the Circumference, an area within a 45km radius around town, Røros Copper Works held the monopoly to exploit the natural and human resources. Work was done under severe climatic conditions, and ways were found to adapt to it for example via the 'Winter Transport Route' on frozen lakes and rivers. Mining lasted here from 1644 til 1977. Røros wasn’t really what I expected it to be. While preparing for my short visit to this former copper mining town, I discovered that it sees one million visitors yearly. And indeed: upon arrival it resembled one large parking lot. I also had imagined a mountainous setting, showing the “harsh climatic conditions” the inhabitants had to deal with that form part of its OUV. At an altitude of 628m it’s not that extreme. Although it does get pretty cold in the winter time at this latitude of course. I reached Røros by train from Trondheim: there is only one practical departure that allows you to visit it on a day trip (leaving at 9.45, returning at 16.30). Try to sit on the right side of the train, as it has the best views of rivers and lakes which are part of the so-called Circumference (the allotted area of privilege to the Røros Copper Works). From the train station I walked straight to the outskirts of the city, where the Røros Museum is located at the site of the old smelting house. Daily at 1 p.m. an English-language walking tour of the town starts from here. The museum area is the most industrial part that you’ll see in the city by the way: the actual mines are miles away and not reachable by public transport. The tour led me and about 10 other tourists first to where the poorest people lived - near the smelting house and the slag heaps. Some huts were purchased by the museum to show their living conditions. Closer to the city center, the original timber houses are still inhabited. A couple of American tourists in our group viewed these as summer homes, but at selling prices of 3-4 million Norwegian kroner (300,000-400,000 EUR) the houses are serious investments. With their bright colors they look more modern than the wooden houses in the poor part of town. But some of these houses are even older than the bare ones. The current owners are obliged to keep their homes painted in the original colors. We also visited a house with a courtyard that was used as a “farm”. Part of the Røros story is that its people were both farmers and miners. Mining was much more important however, and the courtyard that we visited couldn’t hold more than one horse or a few chickens. But there were summer grazing pastures outside of town as well. This particular farm house had an odd history, as it had once been transplanted to an open air museum in Oslo. 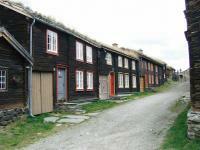 Only after the tourism potential of Røros itself became clear, the house was moved back to its original location. The tour ended at the huge baroque stone church, the number one landmark of Røros – unfortunately it was closed to us because of a wedding. I went on to visit the museum at the ‘old’ smelting house. The smeltery isn’t original – only the foundations are, the rest has burned down so many times that nothing is left. At the exhibition the copper production process is explained via a series of wooden scale models. Worth a quick look – but at a steep price of 100 Norwegian kroner. You’d be hard-pressed to spend more than 2 hours in Røros, although when you have the use of a car you could of course visit some of the outlying mines. When comparing the actual tangible remains with the written history in the nomination file, the Røros story seems to have been spiced up to make it similar to copper mining sites such as Falun or Rammelsberg & Goslar. And it isn’t even close to the global importance or dramatic impact as Potosí for example. I’d rate it as a site of regional interest only (the copper was shipped to Germany and Holland mostly), though Norway (not particularly full of interesting cultural sites anyway) got it placed on the World Heritage List as early as 1980. This is another in Norway's collection of slightly oddball World Heritage Sites. It reminded us both of the Copper Mining Town at Falun in Sweden, just across the border (though admittedly Falun was far more developed). It was a surprisingly popular spot for Norwegian tourists, lots of them around enjoying the mid-summer sunshine. Not many internationals though, still too far off the beaten path I guess. My favourite part was the well-preserved old wooden houses in Slag Road, where people lived quite literally in the shadow of the slag heaps. The large "smelting building" is actually a 1980s reconstruction, though admittedly quite well done. Røros in October 2016, shot with a drone (see link). Read more from André Hope here. I visited Roros on a day trip by train from Trondheim. The train journey involved a steep climb, with a substantial drop in temperature, even in August. The town was compact enough to visit all the significant features like the smelting area, slag heaps and workers' cottages on foot, interspersed with visits to the several hot soup kitchens available. The construction of the houses was of great interest to me, with the walls made from rough hewn logs with interlocking joints at the corners and grass growing in a layer of topsoil on top of the shingle roofs. To include the Circumference (the area of privileges awarded by the Danish-Norwegian King to Røros Copper Works in 1646): Femundshytta and The Winter Transport Route. 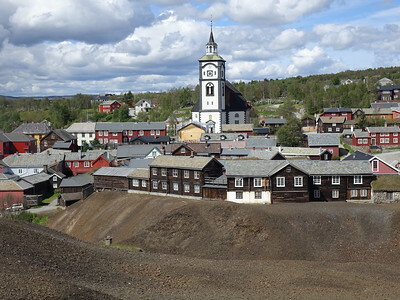 From "Røros" to "Røros Mining Town"
Destroyed during invasion: Røros was burned to the ground in 1678 and 1679 by the Swedish Army during the Scanian War.